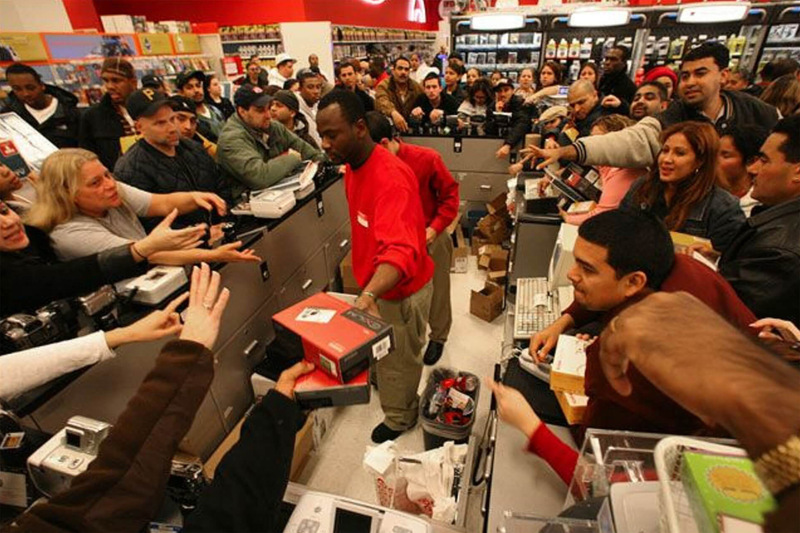 A Black Friday scene in the US. Television screens are filled with Christmas advertising, propagating the apparent need to buy something, and above all electronics, apparel, toys – the most popular Christmas gifts. The festive countdown is well underway. US discount events, hyperbolically labelled 'Black Friday' and Cyber Monday’, have been transposed across Europe, with the periods before Christmas and between Christmas and New Year’s Day becoming the busiest spending times in our annual calendars. Over last year’s discount weekend, British consumers spent a whopping £3.3 billion ($4.16 billion). Masses took to the internet to buy, spending £968 million on Cyber Monday alone, causing the websites of large UK retailers, including Argos, Tesco and John Lewis, to crash. Struggling to cope with the surge of online purchased goods, courier firms imposed daily caps on the number of orders accepted from online retailers. The imagery of cheerful elves making gifts in Santa’s workshop is far from the reality, and contributes to hide from our sight the conditions of workers in the factories that make what we so enthusiastically buy. Some 80 per cent of the world’s toys are manufactured in China, with just about every popular children’s toy bearing a ‘made in China’ label on its underbelly. The harsh reality is that long before Christmas songs are blasting from every department store in the West, these ‘elves’ who are in fact, real, living Chinese workers, are forced to work around the clock to churn out millions of products, ready for arrival in western stores for the festive season. In the UK alone, Chinese toy factories serve a market worth of £2.8 billion ($3.53 billion) a year, yet the big brands for which these products are made – including Lego and Disney – pay factories only a fraction of the shop price, with the social and environmental costs not reflected in the price of these toys. Exploitation is the only term to adequately describe this phenomenon. Of course, sweatshop labour is not limited to toys, also including electronics and apparel. Topping many Christmas wish-lists are Apple, Amazon and Samsung gadgets, companies all found to be complicit in worker rights violations within their supply chains, in the company of notable high street brands such as Nike and Topshop. Samsung have come under criticism for exposing their workers to toxic chemicals and for their ‘no union’ policy in Asia, and Apple for working conditions that have forced workers to suicide. Conflict minerals from the Democratic Republic of Congo end up in more than 50 per cent of all battery powered equipment. To cope with this, workers are forced to endure inhumane treatment, working excessively long hours for unethically low wages, in unsafe conditions, facing verbal, and often physical or sexual abuse. All in complete violation of their fundamental human rights. This is the gruelling monotonous life endured by millions of factory workers across the world, to meet the increased consumer demand of the Christmas shopping period. Christmas consumerism undoubtedly fuels sweatshop labour, but to place blame on consumers is misguided, landing us in the old trap of blaming individuals for a problem ultimately systemic. For many consumers facing stagnating wages and increasing product prices, the mainstream goods are the most, if not only, affordable options. Products like the Fairphone are expensive, and no such alternatives exist for the common laptop or desktop. Arguments that sweatshops increase gender empowerment for women who work in factories, or increase the wealth of individuals previously impoverished, fail to accept one harsh reality: in some places sweatshop employment is akin to slavery. Benefiting while wronging is exploitation at its core. On the other hand, to abandon the global industry in favour of only ‘buying local’ or accepting the existence of sweatshops as an ‘escalator out of poverty’, is to abandon workers in the Global South. Many workers have been made to work in sweatshops because they have no alternatives for making a living. It is the structure that leaves workers with poor ‘choices’, if any, that must be questioned. Genuine worker participation remains the key for making real progress in the fight to abolish sweatshops in supply chains. As consumers, the best approach to the injustice of sweatshops is to support the unionisation of workers, highlight the resistance from workers themselves, and provide opportunities for their voices to be heard, supporting campaigns for better wages and conditions, despite their often slow and incremental progress. Critics argue that campaigns for higher standards often translate to factory closures, but there are two reasons to doubt this claim. Firstly, the gap in pay and conditions between the Global South and the Global North is so large that significant improvements can be made without removing the incentive for companies to remain invested in the Global South. Secondly, in fact major progress has already been made by labour activists challenging the status quo, yielding promising results. See our electronics hub special. Bangladesh is an important example. The disturbing collapse of the Rana Plaza building in 2013 killed over a thousand workers. After that, over 200 apparel brands (such as Adidas and Primark), retailers and importers (from over 20 countries across four continents) have signed up to the Accord on Fire and Building Safety in Bangladesh. A total of 1,592 factories are now covered under the Accord inspection programme. In addition, although Bangladesh still has the lowest minimum wage in the world, this has increased significantly from $38 per month to $68. This change can be attributed to labour unrest and public protest. Bangladesh remains very much open for business. Undoubtedly, this is a reason more and more workers around the globe are coming out in their thousands, braving unemployment, reprisals, and police brutality, to press for better pay and conditions. Despite their courage, sweatshop labour persists. We need to show solidarity. It is unacceptable that a century after 146 workers perished in the 1911 Triangle Shirtwaist Factory fire in New York City, after which public outcry brought US workers basic rights and protections, we are still advocating for the same basic rights and protections in the Global South. Current laws prohibiting sweatshop labour within countries are largely ineffective, inadequately enforced and are too often circumvented or ignored. The absence of effective policy action and legal frameworks to ensure worker rights, together with the lack of sanctions against these abuses, represents state complicity and neglect of the UN Declaration of Human Rights. This applies to states in which manufacturing occurs, and states that benefit from the imports. So, governments and businesses are jointly to blame. The persistence of sweatshops directly reflects the failure of the collective global responsibility to protect the human rights of the world’s most vulnerable people. Eradicating sweatshop labour is daunting, but possible. It requires political will, pro-active multifaceted approaches at the community, national and international levels , and relentless pressure from workers, stakeholders, governments and consumers. In a complex global economy, with supply chain webs, transparency is the first step to accountability. By supporting campaigns by groups like Maquila Solidarity Network, the Worker Rights Consortium, Electronics Watch and SweatFree communities, consumers can show solidarity with those on the frontlines fighting to ensure that the gifts under our Christmas trees are sweatshop free.